To get the most out of Band-in-a-Box®, we offer a huge selection of add-ons, including RealTracks, RealDrums and Artist Performance Sets! The Songs & Lessons PAK adds all of the Essential Riffs & Phrases Series, All of our MIDI Fakebooks, Master Swingin’ Jazz Piano Solos and Comping, the complete Master Solos Series, CopyMe, Duets, 50 Novelty Piano Riffs, 50 Country Guitar Solos, and 200 Folk Songs! RealTracks. RealTracks replace the MIDI track for that instrument, and can be controlled just like the MIDI instrument (volume changes, muting etc.). They follow the chord progression that you have entered so you'll here hear authentic audio accompaniment or solos. Video RealTracks Sets. Have you ever listened to your favorite RealTracks guitar solo or RealDrums drum fill and wondered exactly how the player did it? Now you can see the actual footage of the musician playing along with your song! We have 40 Video RealTracks to choose from, including two full video bands – create a video with up to 5 musicians playing together. You can even include a chord sheet or notation in the video to help you learn, teach, or share with others! Xtra Styles PAKs. Give your projects new life or get inspired with Xtra Styles PAKs for Band-in-a-Box® and RealBand! Xtra Styles PAKs will add TONS of new RealStyles to your collection, spanning several genres like Jazz, Country, Bluegrass, Pop, Singer/Songwriter, and more! Spend less time mixing and more time creating, with Xtra Styles PAKs! Artist Performance Sets. Artist Performance tracks are great for learning-from-the-Pros, since all the Tracks include audio (stretchable to any tempo), notation, on-screen guitar, and guitar tab. Performances typically have a melody for two choruses, followed by a solo for two choruses (one simple chorus and a second advanced chorus). MIDI Styles Sets. These add-ons encompass a diverse range of genres including Jazz, Pop, Rock, Latin, Country, World, Blues, Bluegrass, and more. Each style is a large database of musical patterns and ideas so your songs will never sound exactly the same. MIDI Fakebooks. Hundreds of songs at the touch of a button. Load the songs into Band-in-a-Box® and play along, or create your own arrangements. Learn difficult sections of songs by looping and slowing it down; improve your improvisational skills and more. More MIDI Add-ons. Additional Add-ons to get the most from your Band-in-a-Box® program. RealDrums. RealDrums are not "samples" of single drum hits; they are full recordings, lasting from 1 to 8 bars at a time, playing along in perfect sync with the other Band-in-a-Box®, RealBand and PowerTracks Pro Audio tracks. MIDI SuperTracks. Instead of MIDI styles based on C7 chord patterns that get repeated over every chord, the MIDI SuperTracks are based on actual playing by studio musicians. When you play the SuperTracks with your favorite MIDI synth or VST plug-ins, you'll hear great sounds using MIDI. MIDI SuperTracks are an excellent option for those looking for the editing and control capabilities of regular MIDI tracks, but with the added bonus of incredibly good MIDI sounds! MIDI Soloist Sets. Band-in-a-Box® "Soloist" feature generates great sounding solos to go along with the chords in your song. The more Soloist add-ons you have, the greater the variety of solos Band-in-a-Box® will be able to generate. MIDI Melodist Sets. These add-ons work with Band-in-a-Box®'s "Melodist" feature which can compose a song, complete with intro, chords, melody, arrangement and improvisation, with the push of a button. Essential MIDI Riffs & Phrases. 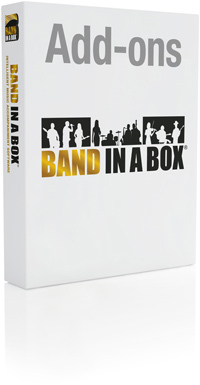 The Essential Phrases & Riffs for Band-in-a-Box® are Band-in-a-Box® files. Play and hear the files, transpose in all 12 keys, slow down for further study, view or printout the notation, or watch the on-screen guitar fretboard or piano keyboard! Video Tutorials. These Band-in-a-Box® tutorial videos created and produced by Team PG are the perfect way to learn how to do more with Band-in-a-Box®.